The CNRS National Institute of Nuclear and Particle Physics (IN2P3) acts as national leader and coordinator in the fields of nuclear, particle and astroparticle physics, technological advances and their related applications, especially in the health and energy sectors. This research aims to explore particle and nuclear physics, fundamental interactions, and the links between the infinitely small and the infinitely large. 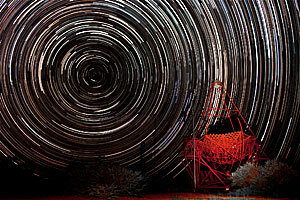 Startrail at the HESS (High Energy Stereoscopic System) experiment site in Namibia. Subatomic physicists and their colleagues across the world strive to answer three fundamental questions: what are the elementary constituents of the subatomic world? What is the structure of nuclear matter? What is the universe made of and how does it behave? The Institute's scientific and instrumental expertise benefits other scientific fields at the CNRS, such as astrophysics, chemical sciences, materials physics, and the life sciences. The IN2P3 is involved in the design of new instruments for medical diagnosis and therapy; in research into the fate of radioactive waste and future methods of nuclear energy production; and in the dissemination of high-tech resources to the business world. The Institute's expertise in computing very large amounts of data (grids and cloud computing) is available to all disciplines. vast arrays of ultra-sensitive sensors to observe the Universe in its cosmological dimension, in relation to particle physics. To facilitate the pooling and optimization of its resources and expertise, the Institute is divided into a limited number of large laboratories, infrastructures and technology platforms, working closely with each other and with other CNRS and CEA institutions, as well as with universities and organizations abroad. The economic and social exploitation of research results is one of the Institute's strategic priorities. Through a network of laboratory correspondents and a national coordinator, the Institute seeks applications for its research results. These and the expertise developed in the IN2P3 technical services prove particularly useful in areas such as health (especially medical imaging), the aerospace industry, the environment (measurement of weak radioactivity through the Becquerel network) and electronics. 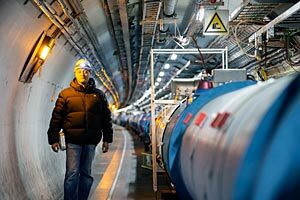 Central view of the Large Hadron Collider (LHC)'s Atlas detector. *As at 31st December 2015 (personnel, structures and business partnerships) and 1st January 2016 (international projects). Source: Labintel, 31/12/2011 – processed by the CNRS / SAP2S; WebContrats.